Manufacturer of a wide range of products which include resistive load, ac voltage controller, bridge converter drive, conversion trainer, dc machine and dc series machine. 46610 - Single and Three Phase Resistive Load is a high wattage resistance network suitable for loading Single Phase and Three Phase supplies and generators. The load banks are used to verify the performance of power sources. 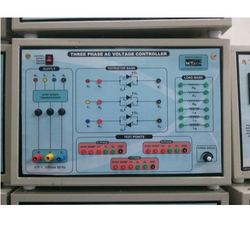 However real loads are unpredictable and random in value hence standard loads are used to stimulate environment for testing power sources..
46606 Three Phase AC Voltage Controller is a useful Training System for Power Electronics Lab to demonstrate the operational working of Three Phase AC Voltage Controller with different loading conditions. It includes the experiment such as speed control of Three Phase AC Motor through anti-parallel SCR configurations with fine control response. It helps students to know how to generate firing pulses for three phase converter using ramp comparator scheme. 46606 is equipped with SCR firing control circuit that deals with triggering, modulation and instrumentation deriving the operating characteristics and capabilities of Converter. It incorporates all the necessary test points in order to explain the gate circuit by analyzing gate waveforms through inbuilt Power Scope. 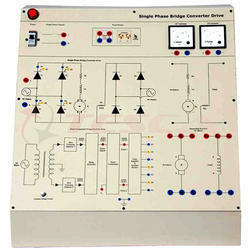 46605 Single Phase Bridge Converter Drive is an Elite Training System for Power Electronic Lab to demonstrate the operational functioning of Single Phase Bridge Converter. It includes experiment such as speed control of DC Motor by using full wave SCR configuration. It helps students to know how to generate firing pulses for single phase converter using ramp comparator scheme. 46605 is equipped with SCR firing control circuit that deals with triggering, modulation and instrumentation which derives the operating characteristics and capabilities of Converter. It incorporates all the necessary test points in order to explain the gate circuit by analyzing gate waveforms at different blocks through inbuilt Power Scope. 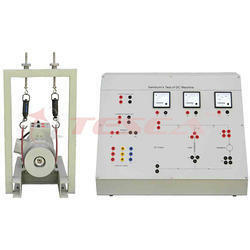 Separate terminals of armature and field winding are provided to operate the machine in either of the excitation mode. 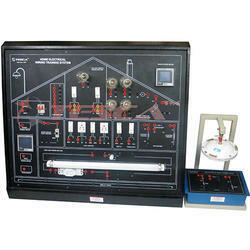 46594 Three to Six Phase Conversion Trainer is a comprehensive training product used to illustrate the core concepts of Electrical Engineering. With this product, user can learn of how Three Phase Supply can be converted into Six Phase with proper phase shift by using three Single Phase Transformers. Separate terminals are provided to analyze Six Phase waveform using Single Phase as a reference waveform. The product familiarizes with the phenomenon of Polarity usually expressed as a round dot. User can also get to know the significance of Three Phase Parameters and verify the Star and Delta connection properties. 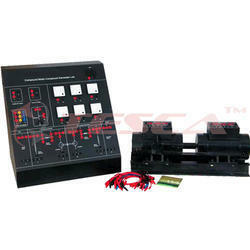 46603 Hopkinson's Test of DC Machine is an adaptable training system used for Electrical Laboratory. It is designed to demonstrate the fundamental concepts and also facilitates easy learning about the various losses of DC Machine. Two similar machines are required to carry out Hopkinson's Test. Electrically these two machines are connected in parallel to determine the Efficiency of DC Machine by separately calculating the losses. Separate terminals of Armature and Field windings are brought out on a terminal box fitted on top of the motor. The training system includes terminals for Rheostat and Starters so that these devices can be connected externally to the panel. 46603 has been designed in such an easy way that users can observe the voltages and current of windings of both the motors. All protection devices are in built negligible chance of fault or danger. 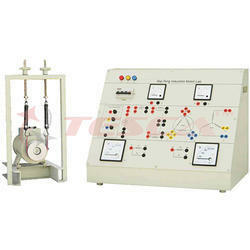 46602 Swinburn's Test of DC Machine is an important training system for Electrical Laboratories. It can be aptly employed for understanding the fundamental concepts and functioning of DC Motor. Swinburn's Test is the method through which losses are measured separately and efficiency at any desired load can be predetermined. Separate terminals of armature and field windings brought out on a terminal box fitted on top of the Motor. The training system includes terminals for Rheostat and Starter so that devices can be connected externally to the panel. The product thus provides explicit understanding of the subject. 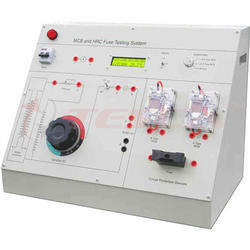 46596 Field Test of DC Series Machine is an elite training system for the Electrical laboratories. DC Machines are an important part of Electrical Engineering Syllabus and to let students understand the basic operation of DC Series Generator, this product play a vital role. It can aptly be employed for performing various exercises like Generator's Working, analysis Magnetic Characteristic, calculate efficiency of both Motor and Generator at any desired load can be predetermined in a easiest manner. Standard meter for calibration of Energy meter and display value of Voltage, Current and Watt. The Energy meter display provides energy consumption details. The facility to connect external Watt meter or Voltmeter and Ammeter is also provided. 46616 MCB (Miniature Circuit Breaker) and HRC (High Rupturing Current Capacity) Fuse Testing System is designed to explain the operating behavior and characteristics of MCB's and HRC fuse. It includes B type MCB, C type MCB and HRC fuse. These are protective devices capable of carrying currents under normal circuit conditions and automatically break the circuit whenever over load or short circuit condition occurs. 46616 provides complete learning contents to demonstrate the internal working of MCB's and HRC fuse. The MCB's are provided in transparent case to visualize the internal architectures. Two precise integrated circuit based Thermometers are provided on bimetal contact of MCB's to analyze the temperature rise and fall. Digital timer is provided with start and stop facility to study the current versus tripping time characteristics. Inbuilt isolated variable AC Power Supply is provided for safety. The student will learn the difference in various classes of MCB's. 46600 Compound Motor Compound Generator Lab is a useful training system for Electrical laboratories that provides comprehensive learning of DC Compound Generator. It can be employed for performing various experiments like Generator Working, Operating Characteristics, Terminal Voltage and Load Current (V-I) Characteristics, etc. Students can make connections easily. 46599 Induction Motor Series Generator Lab is a training system designed to provide comprehensive learning and functioning of a DC Series Generator. It can be used for performing various experiments like Operating Characteristics, Terminal Voltage v/s Armature current (V-I) Characteristics and Load Characteristics, etc. All protection circuits are inbuilt, so there is very less chance of fault or danger. 46597 DC Series Motor Shunt Generator Lab is an adaptable training system for electrical Machines laboratories designed to explain the operational working and characteristic of DC Shunt Generator at different loading conditions. A shunt generator is a method of generating DC output by paralleled connection of field and armature windings and possesses inverse characteristic between load current and terminal voltage.46597 provides comprehensive learning details to demonstrate various exercises like working operation of DC Shunt Generator, no load and load characteristics etc. All connections and appearance are designed in such a manner so that it will look user friendly. Diagrammatic representations are provided on the control set-up so that students can make connections by their own. All protection circuits are in built so there is very less chance of fault or danger. 46601 Slip Ring Induction Motor Lab is an important product designed to demonstrate the operating behavior & working of Three Phase Machine. It provides complete learning contents to enhance practical knowledge and makes students get to know the fundamental concepts of Three Phase Induction Machine. 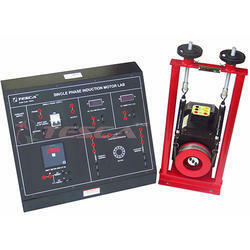 The product includes comprehensive learning of various experiments such as running & reversing phenomenon, no load test, block rotor test and load test of Three Phase Induction Machine. Students can measure the equivalent circuit parameters along with losses, power factor under different loading conditions. Winding terminals brought out on top of the motor with adequate protections so that the students can make connections by themselves. 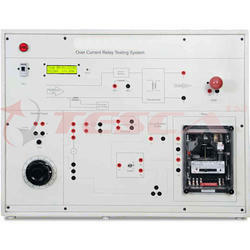 46617 Over Current Relay Testing System is a useful learning product for electrical laboratories. Over Current Relay monitors general balanced overloading and has current/time settings. These settings determine the protective schemes. The relay is IDMT type which has different tripping time characteristics with different current conditions. These are classified in accordance with their characteristic curves which indicate the speed of tripping operation. The typical settings for relay is 0.5-2 Amp in 1-10 seconds. 46617 has accurate voltage, current & time measurement. It includes built-in variable supply, digital voltmeter, ammeter, timer. The timer operation is automatic when current is applied to relay. This automatic operation ensures accurate tripping time measurement. 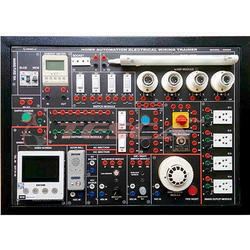 Power Electronic Training Board has been designed specifically to study A.C. Phase Control circuits by using different triggering schemes. SCRs are becoming an essential component for power control. Resistance trigger circuit for SCR to be operated as half-wave static switch and limited range half wave phase control. R.C. trigger circuit for SCR operated as full range half-wave phase control. R.C. trigger circuit for SCR connected in bridge full range full-wave phase control. Half -wave phase control with SCR using UJT trigger circuit-resistance controlled ramp. Full-wave phase control with Inverse Parallel SCRs using UJT trigger circuit-resistance controlled ramp. Full-wave phase control with half controlled bridge converter using UJT trigger circuit-resistance controlled ramp. UJT trigger circuit with series transistor control ramp. UJT trigger circuit using shunt transistor controlled pedestal. UJT trigger circuit-resistance controlled pedestal with improved ramp. UJT trigger circuit - resistance controlled pedestal with cosine-modified ramp. 46607 Power Measurement using CT and PT setup is designed to explore the measurement techniques used in electrical meters for measurement of Voltage, Current, Power etc. Current Transformer (CT) and Potential Transformer (PT) are used to sense Current and Voltage respectively from a transmission line. The various parameters that affect the Current and Voltage sensing using CT and PT are primary and secondary winding turns, gauge of wire and type of core. 46607 provides indepth explaination and experimental analysis of various configurations of Current and Voltage measurement using CT and PT. The students can measure the Voltage, Current, Wattage and Power Factor. 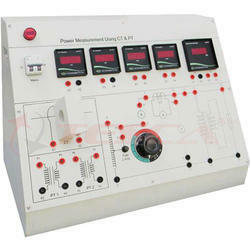 Digital Voltmeter, Ammeter and Wattmeter are provided on panel to increase accuracy of measurement. The meters have very high accuracy and resolution. The CT is provided on panel so that students can change the turns in primary winding and measure the corresponding changes in secondary winding and change in measurement. Protection circuit is inbuilt. 46589 RLC Resonance Trainer is unique product that provides a complete learning content for both Series and Parallel Resonance. Resonance is an interesting phenomenon in electrical circuits in which Inductive and Capacitive elements behave to make a Zero Impedance circuit. This explanation is given with the help of Passive circuits on the Trainer. Multiple combination of components has been provided so that students can calculate Resonance Frequencies for different combinations. Concept of Resonance Frequency is explained very clearly which can be easily seen either on Oscilloscope or on the board display. 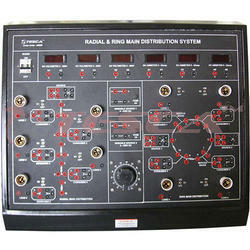 46609 Radial and Ring Main Distribution System is specially designed to illustrate the working phenomenon of Distribution System configured as Radial and Ring Main Distribution System. Distribution System is the part of electric power system which connects the high voltage transmission networks to the low voltage consumer service points. Distribution Systems should be designed in a way that Voltage variation at consumer terminals must be maintained with in +-5%. 46609 provides complete learning content to develop Ring and Radial Distribution System manually. The Voltage regulation is studied by performing experiments & comparison. It includes inbuilt DC Variable Supply with adequate protections, precise digital meters are used along with separate sections for Radial and Ring Main Distribution System so that students can understand the significance of these systems in a proper sequence. 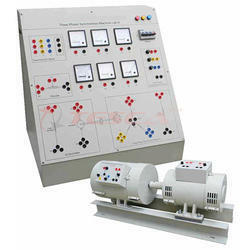 46595 Shunt Motor Series Generator Lab is an elite training system for the Electrical laboratories. 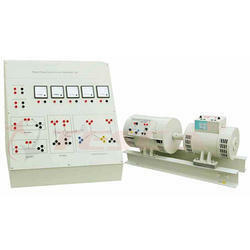 This product help students to understand basic operations of DC Series Generator. It can aptly be used for performing various experiments like Working of Generator, Analysis of Magnetic Characteristic and also efficiency at any desired load. Separate terminals of armature and field windings are provided on top of the machine. Starter and rheostat terminals are provided on the panel so that these can be connected externally to the circuit. The product thus provides complete understanding of experiments with Shunt Motor and Series Generator. 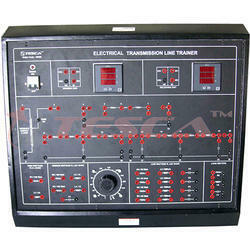 46584 "Three Phase Transformer Lab" is an adaptable training system for the Electrical laboratories. 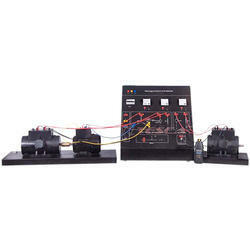 The product helps understand basic concepts and functioning of a Three Phase Transformer. The product is represented in an easy way so that each test can be studied differently in proper sequence. Three Phase configurations such as Star-Star, Star-Delta, Delta-Star and Delta-Delta, Measurement of different losses and consequently determine efficiency and voltage regulation at any predetermined load etc. 46618 Under Voltage & Over Voltage Relay Training System is intended for advanced practical training in protective devices regarding transmission lines, cables and network sections in power systems lab. A Relay is an electrically operated switch use an electromagnet to operate a switching mechanism mechanically. Relays protect the power distribution equipment against continuing voltage sags that are detrimental to motors, ballasts, etc. 46618 provides theoretical and practical experience to students by controlling, monitoring and analyzing individual relay settings and tripping characteristics. 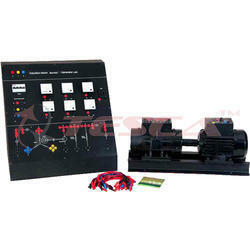 This product provides detailed representation of power transmission system which helps the students to perform experiments with minimal supervision. It also includes built-in variable supply and fast response graphical LCD display which makes the measurement system very precise. 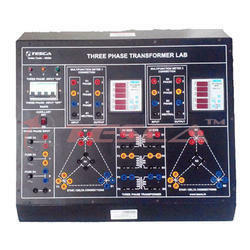 Order Code -46505 Single Phase Transformer Lab is an elite training system for the Electrical laboratories. The product helps you to get fully acquainted with the basic concepts and functioning of a Single Phase Transformer. The product is represented in such an easy way so that each test can be studied differently in proper sequence. The Lab practically expertises you in exercises like Polarity, Turns Ratio, Transformation Ratio, Iron Loss, Copper Loss, Efficiency etc. The varied scope of learning makes the subject understanding complete. The setup is complete in all respect and requires no other apparatus. Practical experience on this setup carries a great educative value for Science and Engineering students. DC Series Motor Lab is a very useful product for any electrical Laboratory to demonstrate the fundamental concepts and operating principles of DC machines. It is useful for students to enhance their practical knowledge which enables complete learning. Demonstrates, operating characteristic of DC Series Motor. Students can get aware of the methods through which the speed of the DC Series Motor can be controlled. It includes terminals for Rheostat and Starters so that these devices can be connected externally to the panel. All connections and panel ergonomics are designed in such a manner that students can make connections by themselves. All protection devices are in built eliminating chances of fault or danger to user. 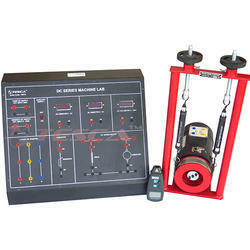 Single Phase Induction Motor Lab is an exclusive and attractive training system for the electrical laboratories. It provides complete learning concepts of Single Phase Capacitor Start Induction Motor. Separate terminals have been provided for main winding, starting winding and capacitor so that student can understand the significance of individual windings along with the role of capacitor in the motor in a simple manner. It includes phenomenon of excitation, running and reversing of the motor. Students can calculate the equivalent circuit parameters and the power factor of the motor. It demonstrates the relation between speed and torque, known as load characteristic or speed-torque characteristic of the motor. All connections and appearance of panel are designed in a simple manner. Students can make connections by themselves. 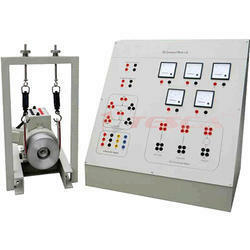 46587 Ward Leonard Method of DC Machine is an elite training system for Electrical Laboratories. 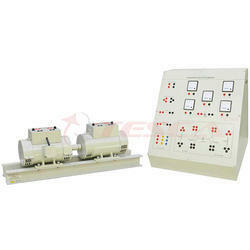 The product helps you to get fully acquainted with the basic concepts and functioning of a DC machines. The product demonstrates the Ward-Leonard Method of DC Machine through which user can not only operate but also control the speed of DC Machine in either direction without using DC supply. Separate terminals of Armature and Field windings are brought out on a terminal box fitted on top of the Motor so that one can connect them separately to the panel and can perform experiment correspondingly. Reverse connecting Switch is provided to control the speed of DC Motor in either direction. The trainer thus provides explicit understanding of the subject. All protection devices are in built so there is almost no chance of fault or danger to user. 46592 Three Phase Synchronous Generator Lab is an exclusive & important product designed to provide comprehensive learning about fundamental concepts and operating principles of Three Phase Synchronous Generator. Synchronous Generators are the primary source of electrical energy. These are used to convert mechanical power derived from (steam, gas, or hydraulic) turbine to ac electric power. 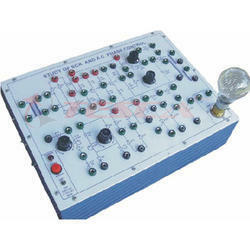 The product provides hands-on experiments like Open Circuit Characteristic of Synchronous Generator and study of the relation between field current and armature voltage. The product is very easy to use. All protection circuits are in built so there is very less chance of fault or danger to user. The varied scope of learning makes the subject's understanding complete. 46611 Single and Three Phase Inductive Load is suitable for loading Single Phase and Three Phase supplies and generators. It consists of robust enclosure that contains three banks of switchable inductive loads. Two terminals for each phase are given which are externally accessible through an inbuilt star delta switch. All banks of inductors are electrically isolated and separate terminals for each phase are provided on panel through a star/delta switch so that the students can connect as a star or delta load for three-phase circuits. Each bank has a set of switches to bring each inductor into the circuit. This allows students to study the effects of balanced or unbalanced inductive loads. MCB's are used to change the inductance of the load. Students can connect the loads to experiment circuits using specially designed patch cords on the enclosed front panel. The load is mounted on a trolley to provide facility of easy movement in laboratories. 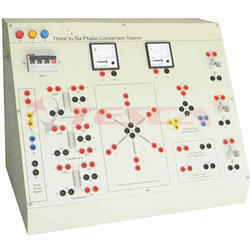 46590Three Phase Synchronous Motor Lab is an adaptable Training System for the Electrical Laboratories. The product helps in getting fully acquainted with the basic concepts, functioning and operating principle of a Three Phase Synchronous Motor. 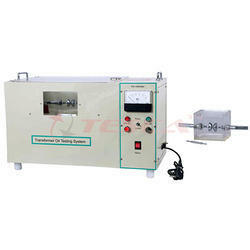 The product includes experiment such as V and inverse V curve of synchronous motor. For engineering students it is important to know how the variation of field current can affect the power factor of the Synchronous Motor and hence improve the system's performance. Separate terminals of windings brought out on a terminal box fitted on top of the motor so that one can connect them separately to the control panel and can perform experiment correspondingly. All protection circuits are in built. So there is very less chance of fault or danger to user. The varied scope of learning makes the subject easily understandable. 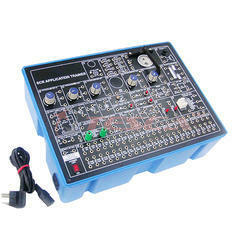 46613 is a high accuracy 3-phase electrical energy measurement device. It is designed to measure any 3-phase electrical system simultaneously without using individual meters. 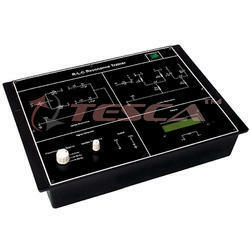 It is a compact table top unit which includes signal processing required to perform Voltage, Current, Frequency, Active Power, Reactive Power, Apparent Power and Power Factor Measurements. This product is suitable to measure active, reactive, and apparent energy in various 3- phase configurations such as WYE or DELTA services. It is Compatible with both 3-phase/3-wire and 3-phase/4-wire systems. All the parameters measured are displayed simultaneously on a single display unit. 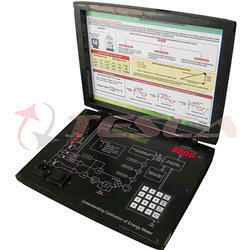 SCR application trainer has been designed specifically for the study of SCR & Triac application. 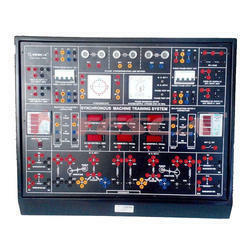 This training board gives better understanding of SCR, triac, UJT & Diac as used in various applications. Practical experience on this board carries great educative value for Science and Engineering Students. Measurement of Xd and Xq of Three Phase Synchronous Machine is an exclusive product designed to demonstrate the operating principle and functioning of Three Phase Synchronous Generator. This machine lab can change the mechanical energy to electrical energy. It helps students to analyse and calculate the significant parameters such as positive, negative & zero sequence impedance, direct & Quadrature axis reactance etc. to correctly construct Three Phase Synchronous Generator. It includes separate terminals for rheostat and three point starter provided on the control set-up so that students can make connections by themselves with adequate protections. 46614 Transformer Oil Testing System is used for testing the dielectric strength of insulation oil used in Transformers. Testing is performed to determine the reliability of the oil filled in Transformer. Transformer oil is used in all types of High Voltage Transformers & circuit breakers. 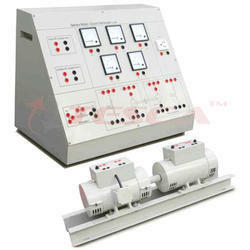 This system includes motorized unit for smooth variation of high voltage. 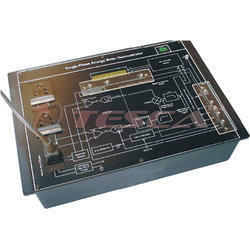 Kilovoltmeter is provided for monitoring high voltage. This product also incorporates automatic tripping mechanism for protection against overload. The equipment consists of two High Voltage Coils having starting winding at earth potential. 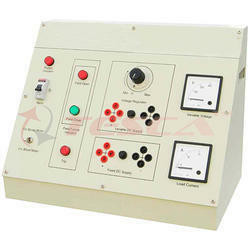 The High Voltage Transformer is designed for testing Duty only. Transmission Line is the key learning concept for Electrical Engineers. Transmission Line Training System is exclusively designed to deliver the learning aspects of the electrical transmission line. 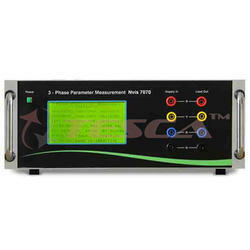 Digital display is provided for easy measurement of Voltage, Current, Power, Power Factor, etc. These parameters help students to learn the characteristics of transmission line and calculations of the ABCD, H, Z parameters. Students can perform various experiments like short, medium and long transmission line and their behavior. Also one of the important experiment which can be per for med with this training system is Ferranti Effect. Home Electrical Wiring Training System is a product which is helpful for students to get familiar with home wiring circuits. This product provides a realistic training environment which is essential for every electrical engineering student and also for apprentice electrician. It consists of Single Phase Energy Meter, MCB, Controlling Switches, Tube Light with Choke, Regulated Switch, Ceiling Fan, etc. Good quality safe terminals and sockets are provided at appropriate places on board for power supply and load connections. 46581 DC Compound Motor Lab is an exclusive training system designed for Electrical laboratories to demonstrate the operation of DC compound motor. Students can understand the fundamental operating principle of DC Compound Motor. This product includes various experiments such as No Load Test, Load Test and Operating Characteristics of DC Compound Motor. The training system includes terminals for 4 point starters and rheostat so that these can be connected externally to the control panel. Power Electronic Training Board has been designed specifically to study the Dv/Dt characteristics of SCR. It is essential to improve the Dv/Dt capability of SCRs to avoid false firing which may be disastrous in some applications. Different schemes given on the board, help the students to design and study various snubber circuits to improve the Dv/Dt capability of thyristors. Test dv/dt estimation of the SCR. Compare Dv/Dt capability by Gate-Cathode terminations. Compare Dv/Dt capability by Gate-Cathode biasing (Voltage biasing). Compare Dv/Dt capability by Gate-Cathode biasing (Current biasing). To improve Dv/Dt capability by transistor snubber circuit. Effect of R.C. Snubber circuit on Dv/Dt capability. Study of different Scheme of R.C. Snubber circuit on Dv/Dt capability. 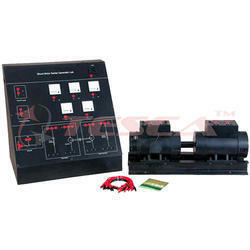 Single Phase Energy Meter Trainer describes a high accuracy, low cost, single-phase energy meter. The meter is designed for use in single-phase, 2-wire distribution systems. The design can be adapted to suit specific regional requirements, e.g., in USA, power is usually distributed for residential customers as singlephase, 3-wire. This is a highly integrated system comprised of two ADC's, a reference circuit, and a fixed DSP function for the calculation of real power. A highly stable oscillator is integrated into the design to provide the necessary clock for the IC. This includes direct drive capability for LCD Display and a high frequency pulse output for Calibration. Well as Conventional Lamps (Dark Lamp Method) to perform the synchronization of two generators. Students can learn the basics as well as advanced experiments and safety conditions with precautions that are encountered while generating power with multiple generators . 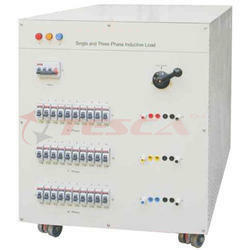 Various terminals including three phase starter terminals are provided on front panel to provide flexibility and ease of connections while performing experiments. Students can perform experiments like Synchronization of parallel generators using advanced and conventional methods, behavior of generator, load sharing, power transfer parameters, analysis of voltage regulation of generator, V curve and inverse V curve in Three Phase Synchronous Generators with a vast flexibility. 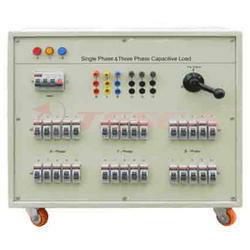 46612 Single Phase & Three Phase Capacitive Load consists of three banks of switchable capacitors. These three banks can be used with Single Phase & Three Phase Systems. 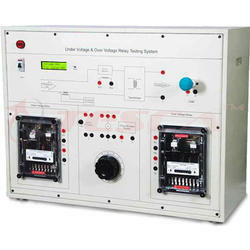 The load banks are used to verify the performance of power source. However real loads are unpredictable and random in value hence standard loads are used and this stimulates environment for testing power sources. The capacitive load bank provides a leading power factor. 46612 is provided with a star and delta switch which facilitates the switching between star and delta connections. The capacitors can be selected in different combinations with the help of MCBs on front panel. The load is mounted on a trolley to provide facility of movement in laboratories.